Gowri Habba or festival is celebrated a day before Ganesh Chaturthi. It is a significant festival in parts of Karnataka, Andhra Pradesh & Tamil Nadu. Goddess Gowri, wife of Lord Shiva, the mother of Lord Ganesha and Lord Subramanya is worshipped throughout India for her ability to bestow upon her devotee’s power, courage, valour. She is the most powerful of all the Goddess and is the very incarnation of Aadhi Shakthi Mahamaya. It is believed that on the thirteenth day Thadige of the month of Bhaadrapada Goddess Gowri is welcomed at her parents’ house. The next day Lord Ganesha, her son comes as if to take her back to Kailasa. The Swarna Gowri vratha is performed on the occasion, to appease the Goddess. On this day, Hindu women and young girls are in new/grand traditional attire. 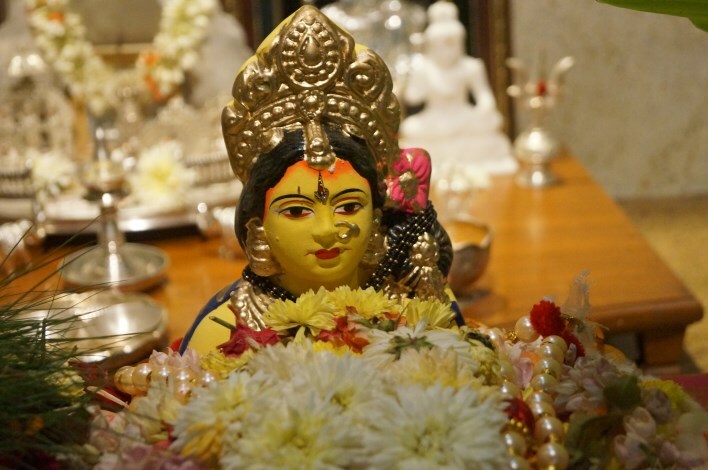 They make either jalagauri or arishinadagauri (a symbolic idol of Gowri made of turmeric) and bestow her for Puja. These days ready-made beautifully painted and decorated clay idols of Goddess Gowri can be bought along with Ganesha statues, at the local market. The goddess’ idol is mounted in a plate, with a cereal (rice or wheat) in it. According to the Vrata, Asthis pooje is to be performed with ‘suchi’ (cleanliness) and ‘shraddhe’ (dedication). A mantapa, generally decorated with banana stem and mango leaves, is built around the idol. The Gauri is decorated with decorations made of cotton, vastra(silk cloth/saree), flower garlands, and ladies get their ‘gauridaara’ (a sacred thread with 16 knots ) tied to their right wrists, as blessings of gauri and as part of the vratha. At least 5 baginas are prepared as part of the vratha. Each baagina usually contains a packet of arshina (turmeric), kumkuma(vermilion) , black bangles, black beads (used in the mangalsutra), a comb, a small mirror, baLe bicchoLe, coconut, blouse piece, dhaanya (cereal), rice, tur dal, green dal, wheat or rava and jaggery cut in a cube form. The bagina is offered in a traditional mora (winnow painted with turmeric). One such bagina is offered to Goddess Gowri and set aside. The remaining Gowri baaginas are given to married women. Another speciality of this festival is that the ‘tavaru maneyavaru’ (the married woman’s parents / brothers) send gauri habbada – mangaladravya to the married girls of their family. Some send money as representation of mangaladravya. In South India many sweet and savouries like the delectable hoLige / Obattu, payasa, Huggi/chitranna and Bajji, Kosumbari are prepared and offer to the Deity before family and friends gather for a traditional get to gather. It continues to the next day with the celebrations for Lord Ganesha’s Festival .